Many dinners that I prepare consist of seeing what is on hand and determining a menu from those ingredients. I don’t like going shopping for one dish. I have a fair amount of pantry space and a large freezer so can typically find ingredients to make something. Last night I wanted to use some chicken thighs from the freezer and decided to serve them with polenta and a green vegetable. I hate to admit this but here goes…I’ve been cooking Italian dishes forever, love food from the North, South and in between, but have never made polenta before. Why? Well I really have no idea ;maybe it was from those years in the south when corn meal was used for grits, something I thought of as a breakfast staple? It was time to take this plunge and they were beyond easy AND tasted yummy AND could easily become a dinner staple. I can imagine so many variations on a theme, spices, cream, cheeses…heaven! This dish was so simple, I would say less than an hour from start to finish so a great weeknight meal for a busy family…or even me! Rinse and pat chicken dry. Season both sides with salt and pepper. Heat large skillet to med high and then put butter in pan, Once the butter melts, add rosemary and thighs. Place chicken skin side up and sprinkle with nutmeg. Cook on one side at least 5 minutes til nicely browned and then turn over. Continue cooking until skin side is nice golden brown and then flip it over again. Add chicken stock and cook for 5-6 minutes. Lower the heat to simmer, add rum and cover. Cook for 20-25 minutes depending on size of the thighs. Occasionally baste chicken pieces with pan liquids. Melt butter in large saucepan over medium high heat. Add garlic and rosemary and saute until softened, about 1 minute being careful not to brown. Add liquid ingredients, salt and pepper and bring to a boil. Gradually whisk in the cornmeal, being careful to break up any lumps that form. Reduce heat to low and continue to cook, stirring often, until thick and creamy, adding more milk if necessary if mixture gets too thick; approximately 15 minutes. Remove from heat, stir in parmesan cheese and correct seasoning. 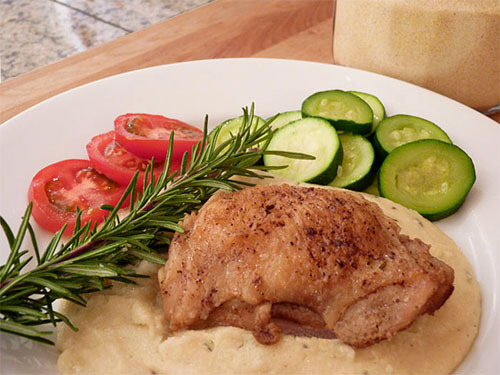 Place a good sized serving of polenta on plate and top with a piece of the chicken. Serve with a green vegetable or salad.